Hundreds of thousands of protesters marched through the Mexican capital on Sunday to demand a manual recount in the disputed presidential election, led by a leftist candidate who says fraud cost him the presidency. As a precaution, the Roman Catholic Church canceled Mass at the city's downtown cathedral as supporters of Andres Manuel Lopez Obrador began to overwhelm the central plaza to the sound of firecrackers and bands. Police officials in the pro-Lopez Obrador city government estimated the crowd at 900,000. Conservative candidate Felipe Calderon, of President Vicente Fox's National Action Party, won by about 244,000 votes in the official count after the July 2 election. Lopez Obrador's Democratic Revolution Party has appealed to the federal electoral court to overturn the official count, alleging illicit government and corporate help for Calderon, ballot stuffing and other irregularities. The former Mexico City mayor says he will stop the protests only if there is a ballot-by-ballot recount. National Action has also filed its own challenges, seeking to stretch Calderon's tiny vote advantage. Calderon has said he believes is no legal basis for a complete recount, and has called on Lopez Obrador to respect official vote tallies. Lopez Obrador supporters such as Xochitl Luna compared the situation to the fraud-stained 1988 election lost by leftist candidate Cuauhtemoc Cardenas and said they were ready for a long struggle. "We could be here six more years," said the 43-year-old unemployed secretary, referring to the presidential term. "In 1988 we were ready to take up sticks and stones," she said. "Today we are prepared to fight with ideas." Marchers carried banners that proclaimed "No To Fraud!" as well as pictures of Calderon with a slash and the slogan: "It won't happen." Fox ended the Institutional Revolutionary Party's 71 year stranglehold on the presidency in the 2000 election. Mexico's constitution limits presidents to one six-year term and he leaves office Dec. 1. Top Lopez Obrador adviser Ricardo Monreal said the July 2 election means that Mexico's fledging democracy is already faltering. 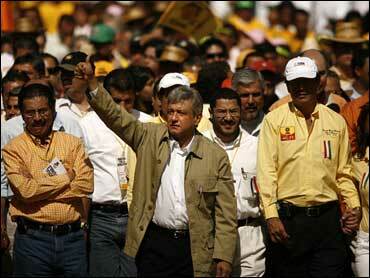 "If another abuse, another (electoral) theft is confirmed," he said, "Mexico will never have clean elections again." Some of Lopez Obrador's devoted followers have lit votive candles outside his campaign headquarters. "He is the most marvelous man in the world," said Eugenia Leal, a 70-year-old retired school teacher who collects a pension thanks to a city program instituted by Lopez Obrador. "I'm willing to follow him from here to the death, or wherever he orders." The dispute threatens to further divide Mexico along geographic and class lines. Lopez Obrador won in the mainly poor southern states, while Calderon swept most of the more-affluent north and northwest. Lopez Obrador may never recognize Calderon as a legitimate president, setting up six years of sparring and protests that could threaten Mexico's political and economic stability. The stock market and currency have swung widely in recent weeks as investors weigh the outcome of the dispute. Calderon is building a transition team and planning a nationwide victory tour, even though his victory isn't official until the elections court issues a final decree by Sept. 6. School teacher Ezequiel Torres, 53, said Lopez Obrador "represents hope." "The right is capable of calling the army into the streets against the public," he said. "The people are tired, fed up, beaten by all that has been done by globalization governments. We want to undo everything that Fox has done."